Sometimes when we think about the future, we are frozen because the gap between where we are and where we want to be seems so large and so daunting. The same can be true when we think about spiritual growth and development. The divide between “here” and “there” seems so great that we are paralyzed and do nothing. So what to do? The key is to just take the next step. When the big assignment is broken down into many smaller ones it becomes doable. When the huge project is divided into more manageable tasks, you can typically see the way forward. How do you follow? You don’t make the entire journey all at once. You just take the next step. 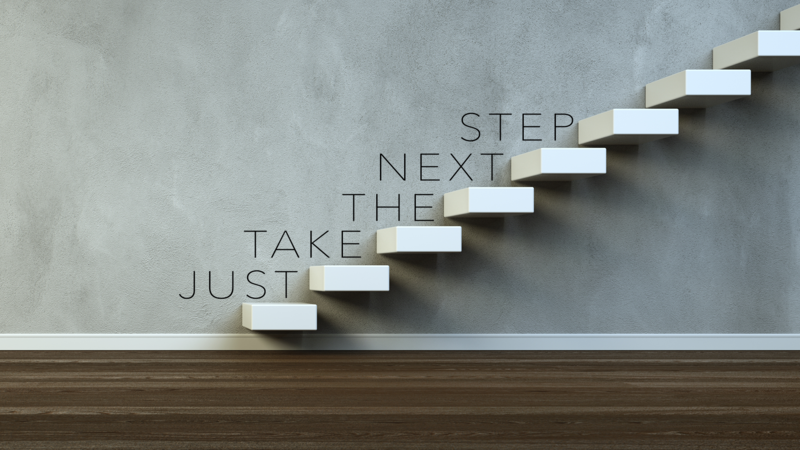 So what would the next step look like for you? Come to Sunday worship. Maybe you’ve heard about Ingleside or seen us on TV or attended a special program, but you’ve never been here to worship on a Sunday. Just take the next step. Commit to Christ and be baptized. You’ve heard the gospel, you understand it, and know you need to repent, believe, and be baptized. So what are you waiting for? Just take the next step. Become a member. How long have you been a “regular attender” now? Isn’t it about time to make a more definite commitment? The next membership class is on January 21 at 4:00 p.m. Just take the next step. Starting reading the Scripture. You’ve heard about “a chapter a day,” and you’ve thought about signing up. What’s the hold up? Just take the next step. Join a group. There are classes, groups, and studies for all ages at Ingleside. It will take a little initiative, but you can find your place. Get past the excuses. Just take the next step. Find your place to serve. Lead a group, teach a class, work with kids, sing in the choir, play an instrument, coach a team, be a greeter, drive a shuttle, run sound, lights, or video . . . well, you get the idea. We need you, and you need to serve. Just take the next step. Tell someone about Jesus. Invite them into the journey with you. You don’t have to have all the answers. Simply suggest that they “come and see.” Just take the next step. I’m very grateful to be on this journey with you, and as we stand on the threshold of this New Year . . . I’m ready to take the next step. And, yes, I’m convinced that the best is yet to come!